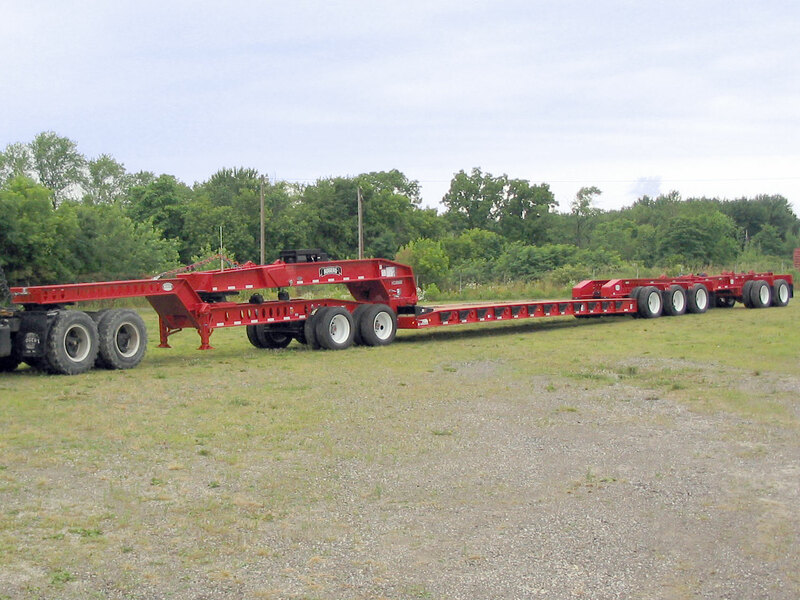 This ROGERS 3+2 "Super Trailer" is road legal to use in most of the lower 48 states. The 26'-0" cambered deck is rated to carry 60-tons in 13'-0" of deck with it completely "set up." It features a tandem-axle Jeep Dolly and the patented "No Foot"® gooseneck with an extension. A 16 HP gas engine, with controls remoted to the side, powers the gooseneck hydraulics. It has a booster axle assembly to create a 14'-1" spread from the center of the last trailer axle to the first trailing axle. The rear frame is detachable so that additional deck can be inserted. Additional weight distribution can be achieved by using camber blocks at the joint of the detachable deck. The axles are spaced at 54 1/2" apart.